Many of you may be familiar with the Great Rescues Calendar and Gift Book—this is the follow-up to that book. 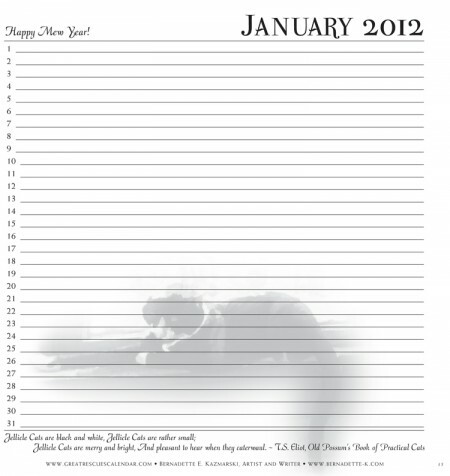 I had wanted to introduce the Great Rescues concept with a product that everyone uses, a desk calendar. But by nature calendars are dated and the product I had in mind was a more timeless day book for tracking events and anniversaries and birthdays and other annual reminders and happenings, and for taking notes and organizing information to be kept over a long period of time. This way, the art and stories can stay with you for as long as you use your day book—I’ve used my current one for over 20 years—and I don’t have to wait another full year to publish the next calendar. Because I had a limited number of 2011-2012 calendars printed I am publishing my first Great Rescues Day Book with those same 16 portraits and stories so that others can still enjoy them, and I can continue work on the next one without worrying about a strict publication date because of the calendar in it. The left-hand page of each spread features the portrait and rescue story, and each month still has its theme reminder, but in place of the calendar is a page of lines with numbers so you can write in a birthday or annual event on the line for that date and not be concerned about the day of the week. These day books also come in handy for keeping track of your pets’ birth/adoption and health records. Most people keep track of contact information digitally, but I have included a few pages for address and phone information. And behind that is a section of the “22 Cats” notebook paper for your notes to yourself or to others. These books are also printed on a matte-finish stock through the entire book for greater ease in writing note with markers and gel pens, and even with pencils. In addition, because I hope you’ll use this constantly for years to come I’ve given up the die-cut cover for now and created a solid cover on heavy-weight matte-finish cover stock. 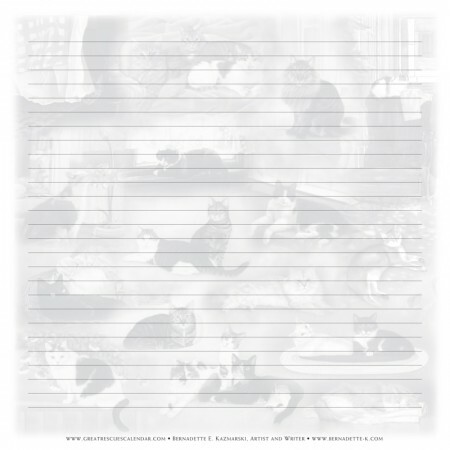 Sample page of 22 Cats notebook paper. 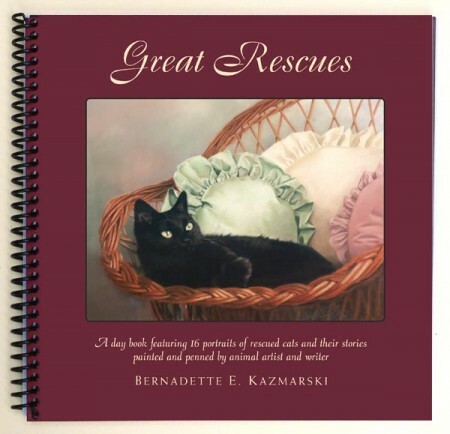 You are currently browsing the great rescues day book category at Great Rescues Day Book.